The definitive, chronological, and up-to-date guide and trade reading order for collecting X-Men, Vol. 3 and X-Men Vol. 4 comic books via omnibuses, hardcovers, and trade paperback graphic novels. A part of Crushing Krisis’s Collecting X-Men: A Definitive Guide. Last updated July 2016 with titles scheduled for release through December 2016. X-Men titles had been distinctly separate from the rest of the Marvel Universe for years even before they headed into two years of tightly coordinated stories and crossovers from 2008 to 2010. It had been since Onslaught in 1996 that the X-Men interacted significantly with other Marvel heroes – or even wider Marvel Universe storylines! – in their own books. They also didn’t get out much. Aside from House of M’s ramifications in Decimation, you’d be hard-pressed to find a non-mutant Marvel hero in any X-Title other than Wolverine! While that made for thrilling in-continuity stories for big X-Fans, it didn’t help bring new readers into the fold – or to share the wealth of X-Readers with other Marvel titles. Marvel’s solution was X-Men, Vol. 3. As with Astonishing X-Men before it, this title occurs relatively free of the convoluted continuity of other X-Titles, even though it made reference to outside events. And, unlike the self-contained Astonishing, X-Men, Vol. 3 frequently featured guests-stars from throughout the Marvel Universe. X-Men, Vol. 3 was cancelled in 2012 with the end of Avengers vs. X-men when Marvel conducted a line-wide reboot. It seemed that the adjectiveless title would be back to hiatus until Marvel announced one of the latest Now books to launch – X-Men, Vol. 4. This volume dropped the guest-stars for a different gimmick – the primary cast would be entire composed of female members! Except, it didn’t feel like a gimmick at all thanks to the X-Men’s legendary roster of women – including Storm, Psylocke, Jubilee, Kitty Pryde, Rogue, and Omega Sentinel, and more. The first arc was one of the best-reviewed stories of 2013. Unfortunately, the title was quickly sent askew by the “Battle of the Atom” crossover and launch writer Brian Wood never quite recovered. Two later arcs by Marc Guggenheim (of TV’s Arrow) and G. Willow Wilson (creator of Ms. Marvel) were well-stepped in history, but not terribly exciting. Begins just after “Second Coming” in September 2010, parallel to Uncanny X-Men #526, X-Men Legacy #238, and X-Factor #207 – and a month prior to the launches ofWolverine (Vol. 4), Daken, and X-23. 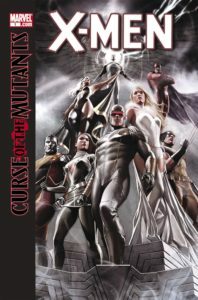 Presumably, the debuts of both Uncanny X-Force (prominently featuring Wolverine) and Generation Hope occur after the “Curse of the Mutants” arc ends in X-Men #6. X-Men, Vol. 3 was launched by crime novelist Victor Gischler, who penned the title from it’s initial vampire arc through #29, which provided some closure to Jubilee’s ongoing plot. Aside from Jubilee, the cast rotated continuously. After Gischler’s run, Brian Wood made the jump from writing Ultimate X-Men to this title. Fans were ecstatic with the characterizations in his early stories, including a tough Storm and a rebellious Rachel Summers. Starring Blade and Dracula. This slow-moving arc mostly focuses on Cyclops, Wolverine, and Jubilee, with assists from Emma Frost, Angel, Colossus, and Storm. Also available in hardcover. Namor: The First Mutant, Vol. 1 also helps to explain off-panel happenings in this initial arc. A poorly received collection of one-shots associated with the vampire storyline, including X-Men: Curse of the Mutants – Storm & Gambit, X-Club, Blade, and Mutants vs. Vampires #1-2. The Storm/Gambit one-shot is solid, and explains off-panel activity in the main book. The rest are inessential, though the Mutants vs. Vampires #1-2 are enjoyable anthology issues. Also available in hardcover. Starring Spiderman and The Lizard. 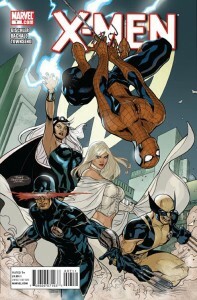 Mostly focuses on Emma Frost, Storm, Wolverine, Cyclops, and Dark Beast. Also includes a Xavier/Jubilee one-shot story, and reprints Marvel Team-Up Annual #1. Also available in hardcover. Also collects Giant Size X-Men #1, which is the kick-off of this story-arc. Also available in hardcover. Collects a fun, pulpy adventure starring Cyclops, Magneto, Wolverine, Emma Frost, Pixie, and Dr. Nemesis alongside the core members of FF – including Doctor Doom! Also available in hardcover. Despite the seeming paradox, this must occur after Children’s Crusade. Collects the Schism mini-series, X-Men: Choosing Sides, and X-Men: Regenesis. This event reshapes the X-Men line. The Regenesis one-shot lays some groundwork for the next portion of X-Men Vol. 3. Also available as an oversized hardcover. Also reprints X-Men (1963) #14. 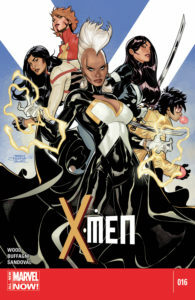 This may be the strongest arc of the series to date, with a team of Storm, Psylocke, Colossus, Warpath, Jubilee, and Domino joined by War Machine. Will Conrad’s artwork makes up for some characterization and pacing inconsistencies. Also available in hardcover. The resolution to Jubilee’s vampire storyline. 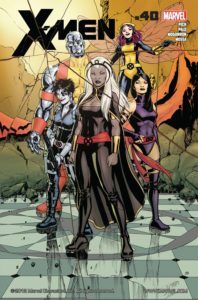 Brian Wood takes over writing duties of the next arc, which stars Storm, Psylocke, Colossus, Domino, and Pixie. The final two issues by writer Seth Peck explicitly occur after Avengers vs. X-Men. Avengers vs. X-Men: See Marvel Universe Events. This book did not include any issues that crossed over with the event. 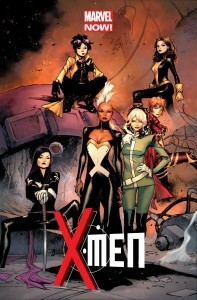 In a shocking announcement, Marvel debuted an all-female X-Men squad written by fan-favorite Brian Wood and drawn by Marvel superstar Oliver Coipel. While the opening arc was a blockbuster, the book almost immediately lost steam (along with losing Coipel, Kitty Pryde, and Rogue) and became a muddled read. Later issues by Marc Guggenheim were a similar chore, and while a final arc by G. Willow Wilson got the character’s voices right it featured weak artwork. Also includes the classic Uncanny X-Men #244, Jubilee’s origin. A four-issue mini-series starring Wolverine, Rogue, and Kitty Pryde that occurs prior to Battle of the Atom. The 2013 X-Men 50th Anniversary crossover. Collects X-Men Battle of the Atom #1-2, Uncanny X-Men #12-13, All-New X-Men #16-17, Wolverine & The X-Men #36-37, and X-Men # 5-6. Available in oversize hardcover. This is a standalone Marc Guggenheim story set in space and featuring SWORD and Deathbird. This is somber, claustrophobic G. Willow Wilson story focused heavily on the character voices – Storm and Rachel’s, particularly.